Director of Athletics Denise Udelhofen announced on Tuesday six new members into the Loras College Athletics Hall of Fame. 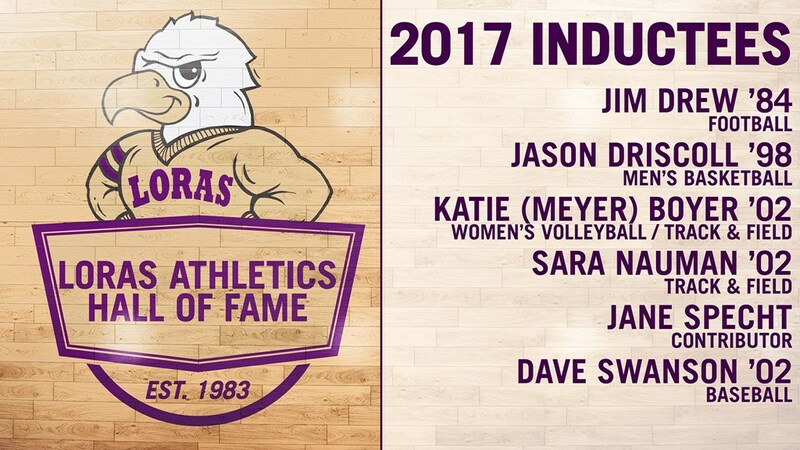 These six individuals represented the very best of Duhawk Athletics during their time in the Purple & Gold and will be formally inducted on Friday night of Homecoming Weekend in October 2017. The inductees include Jim Drew ’84 (football), Jason Driscoll ’98 (men’s basketball), Katie (Meyer) Boyer ’02 (women’s volleyball, track and field), Sara Nauman ’02 (track and field), Jane Specht (contributor) and Dave Swanson ’02 (baseball). On Friday, Oct. 6, these six honorees will be officially inducted during the annual Hall of Fame Banquet inside the Athletic & Wellness Center as well as receiving public recognition during halftime of the football game against Simpson on Saturday, Oct. 7. Read full story on duhawks.com.